Up your main course salad game with this colorful and easy to make Beet Quinoa Salad! After all, Salad doesn’t have to be an afterthought to a main dish. 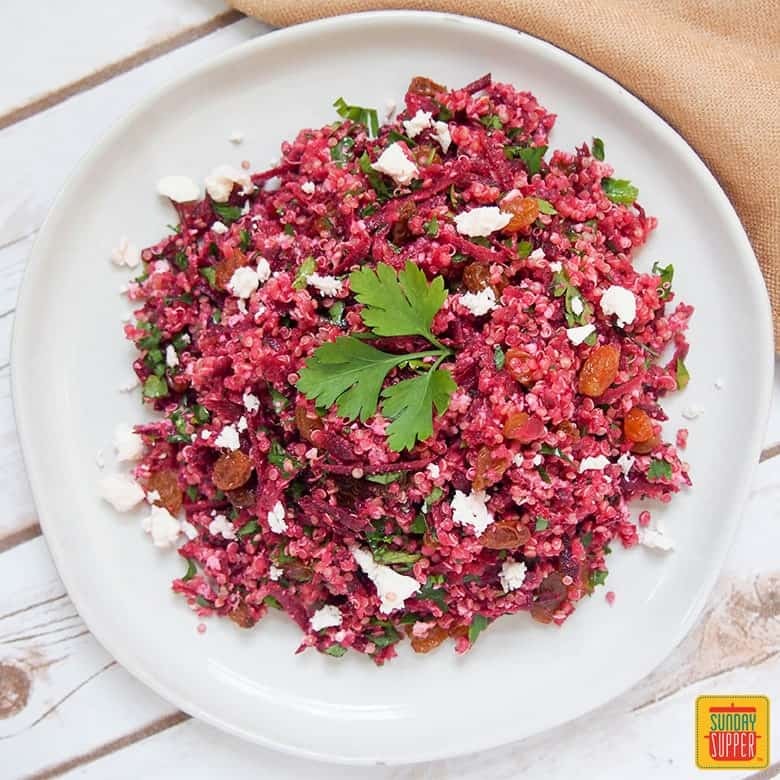 This bright Beet Quinoa Salad is a main course salad perfect for a light meal, potlucks and more. Easy, delicious and versatile too. What is a Main Course Salad? Main course salads are a refreshing change for easy weeknight meals, and we love them for easy Sunday Suppers in summer too. We enjoy main course salads a lot more during the summer months when you don’t always feel like something heavier. Particularly at lunch time, we often pack a main course salad and/or quiche to take with us for a picnic rather than sandwiches as we just enjoy them more, and salad doesn’t weigh us down. What makes this Beet Quinoa Salad so great? Whether they’re grated or thinly shaved, beets are wonderful to eat raw. You get much more of the sweet flavor than when they are cooked. 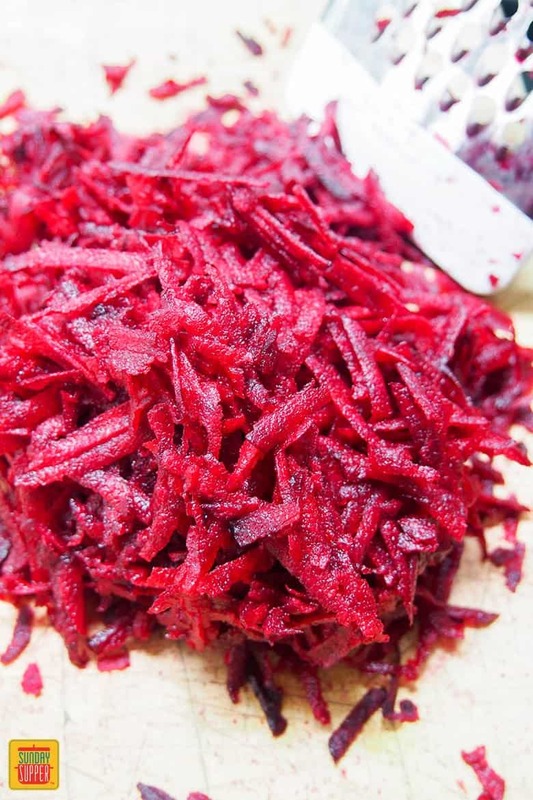 If you are not used to using beets raw, they work really well grated. They are still firm, so raw beets add a lovely crunch to the salad, but the pieces are small enough they are easy to eat. Raw beets have a lovely slight sweetness as well, which works great with the other flavors in the Beet Quinoa Salad. 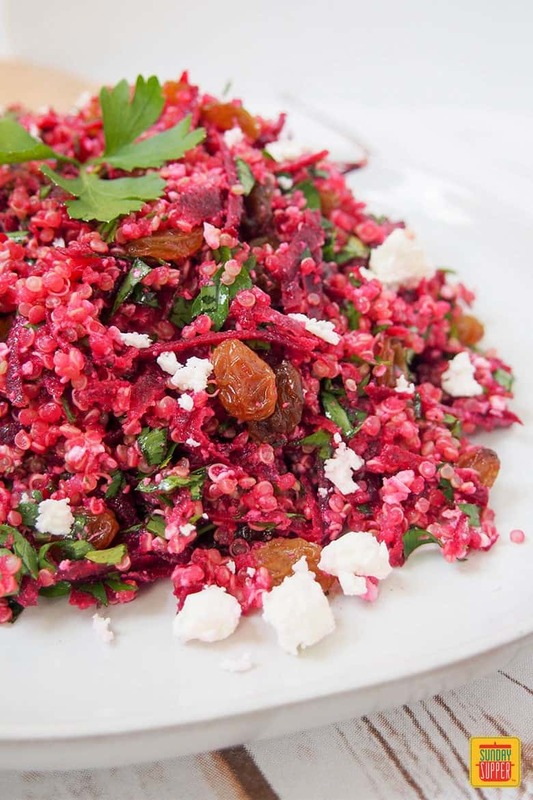 Plus, the quinoa takes on the beautiful color of the beets giving this salad a vibrant color. One of the other things I love here is the feta dressing. You might think it a little unusual putting feta and cumin in a dressing, but believe me they both work so well. 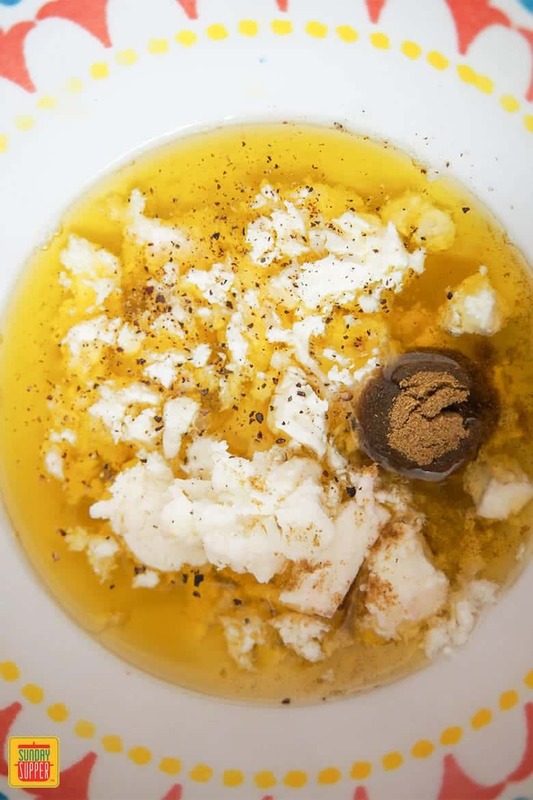 True, a feta dressing doesn’t necessarily blend as smoothly as some other dressings, but it really doesn’t matter once you mix it up. And the flavor the feta dressing gives the Beet Quinoa Salad is wonderful. 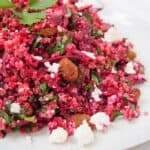 This raw beet quinoa salad is easy, flavorful and such a versatile main course salad that you can enjoy at home or take with you to share. Be sure to give it a go and let us know what you think! Up your main dish salad game with this colorful and easy to make Beet Quinoa Salad! It's the perfect healthy, light meal!